The above info came from Eric Wilkerson, and was edited by yours truly (contact me). The image came from Giovanni. Giovanni, or Sakaki, is known for being the leader of Team Rocket ("Rocketto Dan", translated as "Rocket Gang"). However, before the events of the Pokemon games, he was also the leader of the Viridian City Gym. Sakaki is often portrayed as being a cruel person, arrogant of his own power and his only known motive for the destruction is to take over the world. However, this can vary depending on what form of media. For example, in the "Pokemon Adventures" manga, he is seen as being an incredibly cunning person, with a strong sense of nobility and honor as well as a deep compassion towards his own family. It is later discovered that his evil intentions were a "mask" of sorts to disguise his true motives: To reunite with his lost son Silver. Also, in the "How I Became a Pokemon Card" manga, Sakaki is shown as a child sharing many of Satoshi's characteristics saving Persian from a Pokemon collection agency even though Persian bit him twice. In the anime though it is clear that all he is interested in is power. Which is his reason for creating Mewtwo in "Pokemon the First Movie" (Japanese: "Pokemon: Mewtwo's Counterattack") and again hunting down Mewtwo in the special "Pokemon: Mewtwo Returns" (Japanese: "Mewtwo: I exist here") his only known family in the anime is his mother- addressed only as "Woman Boss" throughout the Drama CD that she appeared in. Team Rocket was founded by his mother, and he inherited the organization sometime within the past 18 years although it is unknown exactly when or how. Sakaki is hardly ever present in his Gym, in the anime this is solved by having multiple Rocket Agents watch the gym while he is away, however it is simply locked or abandoned in the games/manga until he appears again. After Team Rocket was disbanded in the R/B/Y games, your rival (Blue) becomes the leader of the Gym. His only accomplishments that he had while serving as a Gym leader was creating the move fissure (earthquake on FR/LG) his specialty is Ground types, however he also has a few Pokemon of multiple types and it is claimed that his favorite type Pokemon is "Strong Pokemon"
The above description came from Chloe Williams, and was edited by yours truly (contact me). Giovanni is the cruel and evil leader of the Team Rocket gang. He wants to collect all the rarest pokemon and rule the world. It was he who was responsible for the creation of Mewtwo. When Mewtwo left him, Giovanni continued to hunt down Mewtwo in "Mewtwo Returns", until Mewtwo erased Giovanni's memory of Mewtwo. 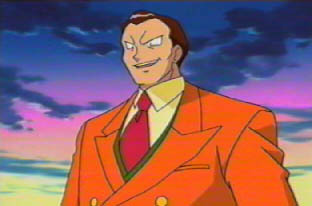 Giovanni still isn't close to ruling the world...yet. The above description came from Eric Wilkerson, and was edited by yours truly (contact me).